The online application are invited for Haryana Police Recruitment for 1017 male constables (general duty) and Wireless operator in telecom wing of Haryana police. Eligible and physically fit candidates may apply through the following website; www.hprbonline.com or www.hprbonline.in before 18-09-2014. Application fees: General candidates are to pay Rs.100/- and no fees for others. Age limit: lower 18 years and upper 25 years for a candidate. A citizen of India or Nepal or Bhutan. Candidates must provide the character certificate of school, college and university. For Male Constables (General duty): 10+2 for all categories. For Male Constables (Wireless operator): Two years certificate in ITI in Electronic/Compute/Telecommunication with minimum 60% marks in matric with Hindi/Sanskrit or higher qualification. Applying online registration and ID no will be generated. The candidates are deposit the fees in Bank of Patiala through challan. Interview: Those candidates get minimum 15 marks in Physical Efficiency test (PET), call for the interview. 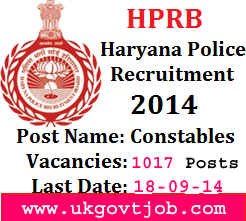 Get more information regarding the recruitment in Haryana Police Board for 1017 post of constables i.e. general instruction to apply, download the e-challan form, hall ticket etc.